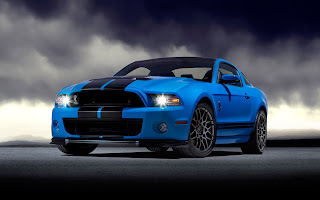 The Ford Mustang Boss 302R kicked off the 2012 Continental Tire Sports Car Challenge season with a bang, with the No. 61 Roush Performance team of Billy Johnson and Jack Roush Jr. taking the first win of the season at Daytona. That momentum didn’t carry into the second race of the season at Barber Motorsports Park, though, with none of the Mustang teams having a very successful weekend. The Rehagen Racing Boss 302R was the top finisher in 9th, followed by the Starworks Motorsports Boss 302R in 13th. Both Roush teams were involved in bad wrecks and finished far back in the pack, with the No. 61 Boss 302R ended the race 11 laps back and the No. 51 Boss 38 laps behind. Regardless of how well the Ford Mustang teams do during the race, we always like seeing pictures of them out on track. Feel the same? Check out a gallery of Mustangs from this past weekend’s Barber 200. This entry was written by by MustangsDaily (Mustangs Daily) and posted here on Sunday, April 1st, 2012 at 2:18 pm and is filed under 2012 barber 200, barber 200, barber motorsports park, boss 302r, ctscc, ctscc 2012, ford mustang boss 302r, grand-am, Motorsports, mustang boss 302r, Photo Galleries. This article was not written by us, rather gathered using RSS feeds listed here. We take no credit for this article. You can leave a response, or trackback from your own site.